Coburg have fought hard with the spirit of the ANZACs in Saturday’s round three clash, going down to Box Hill by 72 points at Piranha Park. 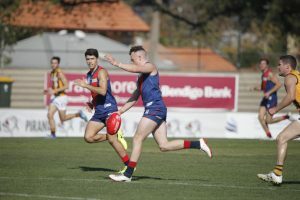 The opening term saw the Lions play some of their best footy, with Hisham Kerbatieh and Sam Lowson kicking three goals each for the perfect start. Running hard through the corridor and laying crushing tackles, it was a new-look Coburg side that caught Box Hill off guard. With the Hawks hot on their tails, the Lions were exciting to watch and able to find space to hold a 15-point lead at quarter time. It wasn’t long before Box Hill found their feet though, taking the lead by 20 points at half time. Tensions rose as scuffles broke out across the ground throughout the second-half, as Coburg continued to play with a ‘nothing-to-lose’ attitude. A Kerbatieh goal brought it back to 24 points early in the last term, but the Hawks were eventually able to run away victors after a lapse from the young Lions. Speaking post-game, forwards coach Tom Curran acknowledged how well Coburg played early, and hopes that with more experience they can begin to play that way for the entire match. Curran also praised small forwards Kerbatieh (5 goals, 10 touches) and Lowson (4 goals, 12 touches) for their efforts. Skipper Tom Goodwin was out with concussion, so hard-working defender Nathan Blair stood in as captain, while Mark Orr, in his first game of the season, and former Calder Cannon Aidan Tilley took turns in the ruck. Coburg’s defence was led by Blair, Ryan Exon and Sean Gregory, who all put up a huge fight, with Lochie Dickson again showing great signs in just his third senior game. Debutant Jay O’Donoghue kicking his first Senior VFL goal was a major highlight, followed by Seymour recruit Jack Murphy bagging his first as well. Box Hill’s Teia Miles was awarded the Gibbs-Lines medal for best on ground, as the Hawks hold on to the ANZAC Cup for another year. Next week sees Coburg still searching for their first win of 2018, as they take on North Melbourne at Piranha Park on Sunday at 1pm. Goals: Kerbatieh 5, Lowson 4, O’Donoghue, Murphy, Cannolo. Best: Exon, Kerbatieh, Belo, Dickson, Lowson, Hunt. Image courtesy of Jordan Zmood Photography. Sam Lowson Named Lion of Round 3!